Christmas pudding cake pops with plain white flour, cocoa powder, unrefined golden caster sugar, baking powder, butter (unsalted), milk (whole), egg(s) (free range), icing sugar, salt, butter (unsalted), vanilla extract, icing sugar, milk (whole), dark chocolate chips, icing sugar, sugar paste icing. 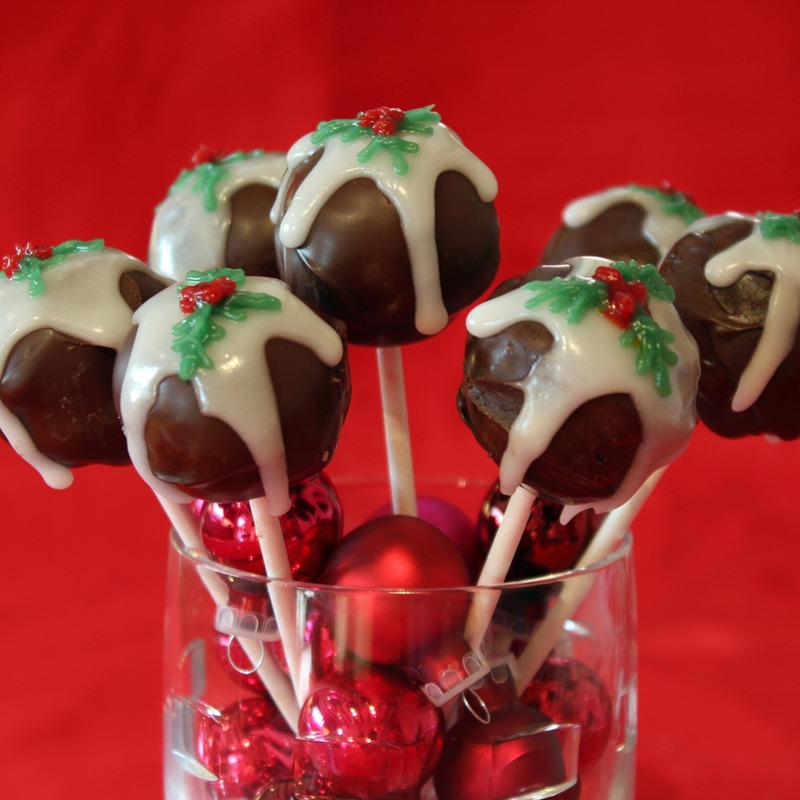 To make this christmas pudding cake pops for – persons you will need for preparation and for baking. Step 1Preheat the oven to 170°C (150°C, gas mark 3) and line a muffin tin with muffin cases. Step 2To make the sponge place the flour, cocoa powder, sugar, baking powder, salt and butter into a freestanding mixer with the paddle attachment or in a bowl and mix with an electric mixer until you get a sandy consistency. Step 3Whisk the milk and egg together in a jug then slowly add to the flour mixture and beat until smooth and well mixed. Step 4Spoon the mixture into the paper cases and bake in the oven for 20-25 minutes, until the sponge bounces back when touched or when a skewer comes out clean. Step 5Cool on a wire rack, then leave in the fridge overnight to stale. Step 6To make the buttercream, put the butter in a large bowl and cream until pale and fluffy, then add the icing sugar and mix until smooth. Add the milk and vanilla extract then whisk until light and fluffy. Step 7Remove the cakes from the fridge and crumble into a large bowl until it resembles fine breadcrumbs, then mix in some of the frosting until the mixture can be formed into small balls. Step 8Make balls of the mixture by rolling between your hands and place on a baking tray, then put in the fridge for 15-20 mins. Step 9Melt the dark chocolate according to the instructions on the packet, then dip a lollipop stick into the chocolate and place in the cake ball. Once you have sticks in every ball, dip each one in chocolate to entirely cover the ball, then leave to set. Step 10Make the icing according to the instructions on the box to a thick consistency, then using a teaspoon pour a small amount onto the top of the cake pop allowing it to flow down the sides of the ball. Step 11Once all the cake pops have been iced and this has set finish the decoration with some holly and berries using the green and red sugar paste icing.